Chelsea powered into the fourth round of the FA Cup as second-half goals from Willian, Loic Remy and Kurt Zouma completed a 3-0 victory over Watford. The first half finished goalless and, with the Championship visitors enjoying moments of promise, tension was beginning to build on a freezing afternoon at Stamford Bridge. But the interval arrival of Willian and Diego Costa from the bench had the desired impact, with the Brazilian plundering the opener and the Spaniard involved in two of the three goals. The Premier League leaders played most of second half with strikers Didier Drogba, Costa and Remy on the pitch and the fire power eventually told, with Watford’s defence cracking for the first time in the 58th minute. Remy and Zouma put the result beyond doubt to keep under-strength Chelsea in the hunt for silverware on four fronts and, for all Waford’s endeavour, there was a gulf in class between the rivals. The underdogs barely touched the ball as Chelsea made a brisk start, almost taking the lead in the seventh minute only for Gary Cahill to stab Andre Schurrle’s free-kick over the crossbar. Oscar, along with Cahill and Cesar Azpilicueta the only three survivors from the New Year’s Day defeat by Tottenham, needed treatment following a heavy collision with keeper Jonathan Bond before groggily rising to his feet. The one-way traffic continued to flow unchecked into Watford’s half, with Ramires tumbling beneath a well-timed tackle as he darted into the area. For all their possession, Chelsea were unable to create any clear cut chances as the third-round tie neared the half-hour mark and there were even occasional signs that Watford were warming to the task of claiming a high-profile cup victim. Sharp reflexes from Bond kept Drogba out as he sought to nod home Remy’s cross and home fans chanted the name of Jose Mourinho after the incensed Blues boss had stalked down the touchline to demonstrate over a clumsy challenge on Ramires. 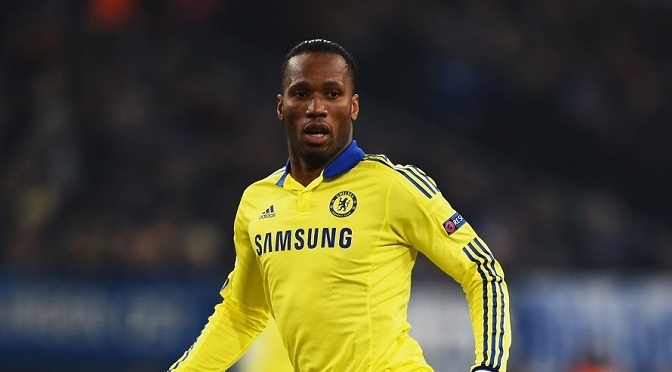 Mourinho then added his voice to a dispute between Drogba and fourth official Lee Collins – the Ivorian needed a replacement shirt because of a large rip and was forced to wait before rejoining play. The imposing figure of Drogba continued to cause Watford’s defence the greatest problems, but it was at the home end that panic reigned at the end of the half after Odion Ighalo pulled a low shot inches wide. Oscar and Schurrle were withdrawn for Costa and Willian at half-time, but the Championship team barely noticed as they surged out of the blocks, with burly captain Troy Deeney making his presence felt. It was Deeney’s shot that Filipe Luis almost turned into his net as Chelsea were opened up by an incisive attack, although a moment later Bond was forced to deal with an attempt by Drogba. The keeper could nothing to prevent Willian’s thunderous 58th-minute shot from the edge of the area after Costa and Remy had set up the Brazilian playmaker, who picked his spot and drilled the ball home. Watford’s hopes were as good as over 11 minutes later when Costa’s shot was blocked by Craig Cathcart, the ball falling for Remy to blast past Bond. And the nerves evident earlier in the half were a distant memory soon after as Chelsea added their third, Zouma heading home Ramires’ pinpoint cross.